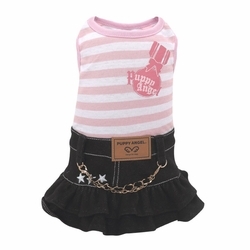 Great for the girls this funky Puppy Angel dress is brilliant for the beach. Made from a cool striped bodice with a Puppy Angel Pin rosette on the back the denim skirt is gently ruched for added fun. There are star studs on the skirt with a chained belt making this one hot outfit.